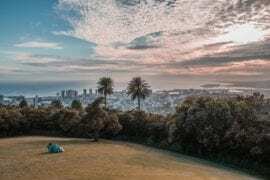 The 8 Best Oahu Airbnb Rentals: Waikiki, North Shore, Kailua And More! 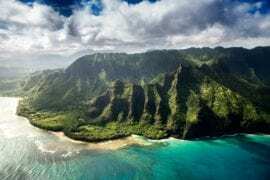 The third-largest of Hawaii’s eight major islands is beautiful Oahu (O’ahu). In case you’re planning a trip soon, we scoured this island paradise to find you the very best Oahu Airbnb rentals. Beyond the buzzing, cosmopolitan capital Honolulu, some of the most popular places to stay in Hawaii are on Oahu. Discover turquoise water and white sand along famous Waikiki Beach, a low-key paradise in laidback Kailua, and vintage ‘aloha’ spirit in the secluded North Shore. Wherever you choose to stay, we promise you’ll never be bored. There are so many things to do in Oahu, from high-flying helicopter tours and exciting water sports to vibrant nightlife and incredible hiking/biking trails. Have we convinced you yet? 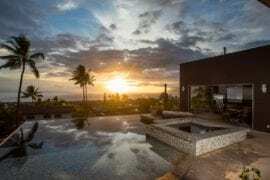 Check out our roundup below of the very best Oahu Airbnb rentals and get ready to plan your memorable Oahu getaway. 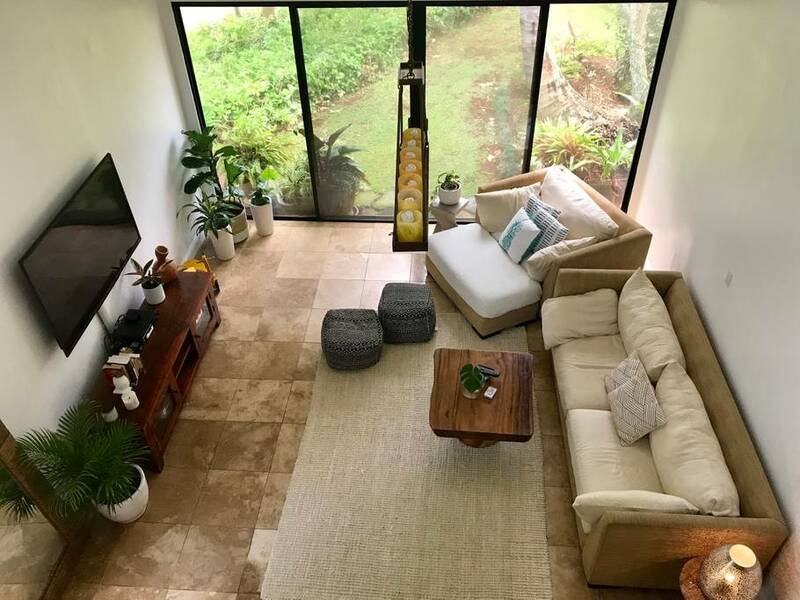 The beautiful and brand new North Shore Oahu Airbnb vacation rental is perfectly suited for a big family or group of friends. 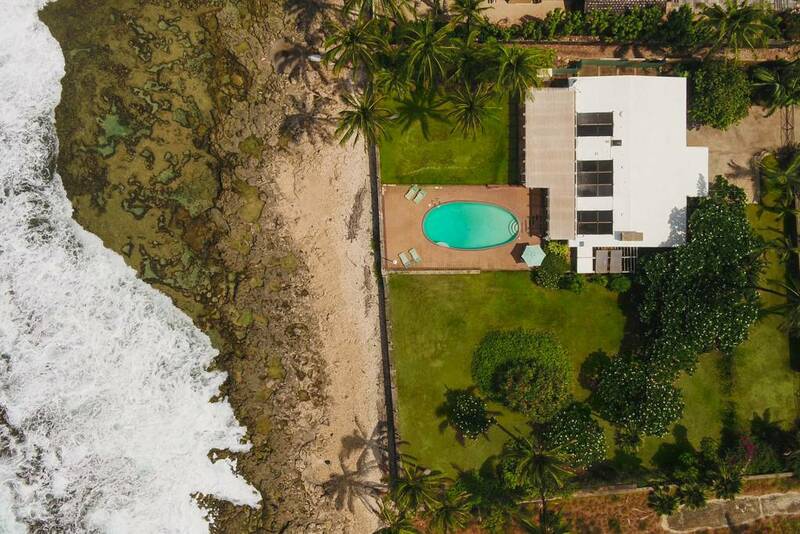 Impeccably designed with a luxurious island vibe, this spectacular family home is located close to Laniakea Beach, Turtle Bay, and gorgeous Papailoa Beach, the North Shore’s most exclusive spot. 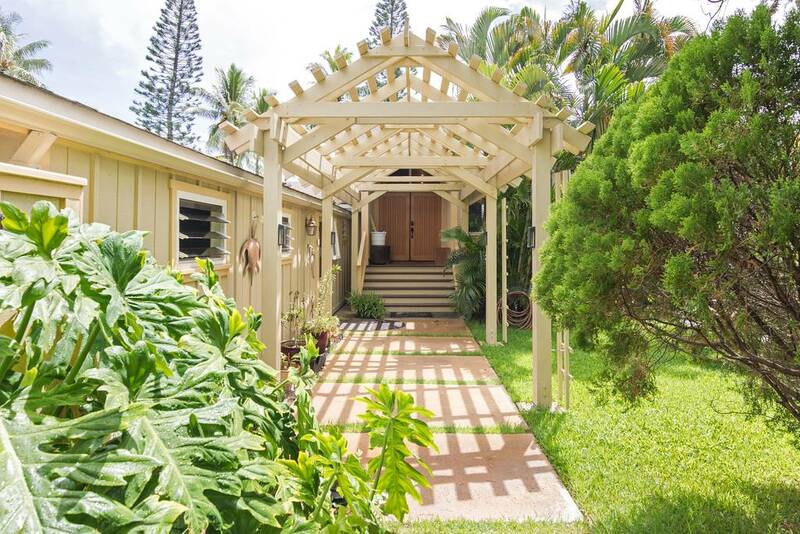 Skip the North Shore traffic — this home is strategically positioned just a short drive from Haleiwa Town’s restaurants and shops. This stunning property can accommodate up to 8 guests with three big bedrooms and two modern, stylish bathrooms. The gourmet kitchen is open to a dining space and a large living room with flat screen TV. Outside, a shaded lanai and private backyard include additional dining space, modern daybed, and an outdoor BBQ grill. 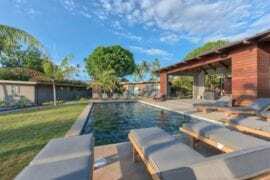 Available for around $550 a night, this luxury vacation rental was designed for the perfect Hawaiian family getaway, with plenty of space to entertain and relax together in style. This may be one of the most unique Airbnbs in Honolulu we’ve seen! 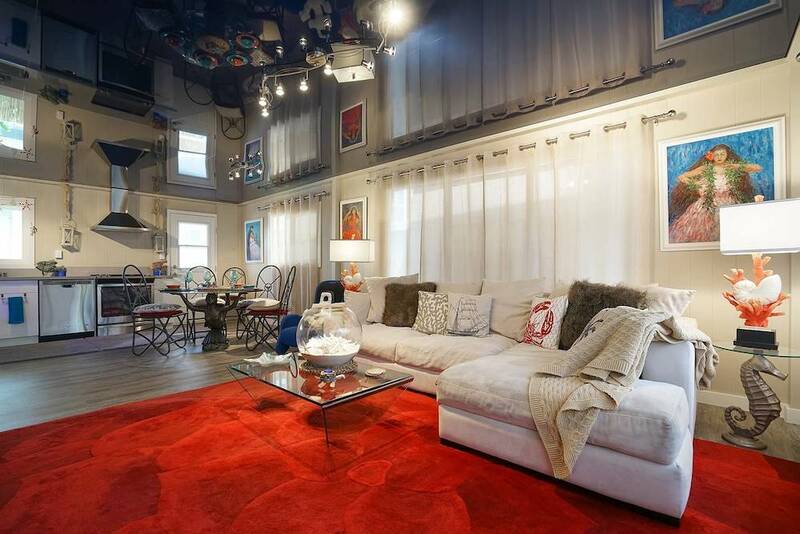 Bursting with color, funky decor, and quirky architectural details, this colorful Oahu Airbnb rental is the perfect choice for a creative family with kids. The home can accommodate up to 6 guests easily, with three bedrooms and two bathrooms. One of the bedrooms is set up with two single beds, ideal for two kids or teenagers! Available from around $300 a night, this stylish Oahu Airbnb is located in one of Honolulu’s coolest neighborhoods. You’re just minutes from the Ala Moana Mall, as well as numerous restaurants and public transportation. Enjoy all the amenities that city life can offer, while still just a short drive away from Oahu’s best beaches and hiking trails. 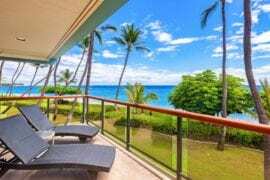 Escape to Oahu’s peaceful North Shore and book this tropical townhouse Airbnb in Turtle Bay from around $400 a night. Beautifully decorated and styled to coastal-Boho perfection, this upscale Oahu Airbnb rental is a relaxing island getaway. The entire townhouse can accommodate up to 4 guests with two bedrooms and two bathrooms, making it the perfect choice for a romantic couples’ retreat or Hawaiian vacation for a small family. This lovely home faces a lush, landscaped garden for the ultimate in tranquil, tropical vibes. Enjoy access to a community swimming pool and two tennis courts nearby. The townhouse itself has a fully-equipped kitchen with dishwasher, as well as a laundry machine for your convenience. The spectacular Turtle Bay location is the ideal blend of a peaceful, private environment with easy access into town for great restaurants and vibrant nightlife. One of the most popular places to stay in Oahu is Waikiki Beach in Honolulu. 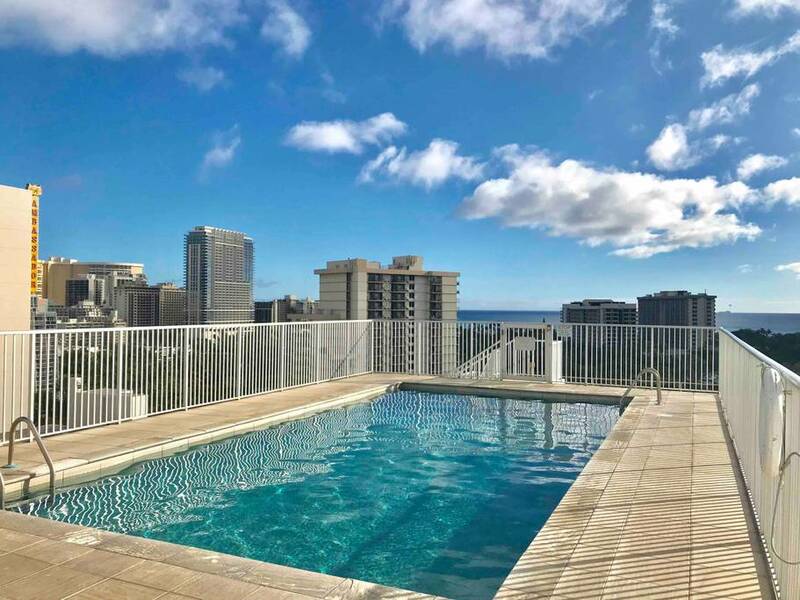 Enjoy spectacular ocean and skyline views from this luxury condo Airbnb rental in Waikiki Beach, available for around $425 a night. Professionally designed and decorated, this Waikiki Beach condo features custom furniture, a huge wrap-around balcony with views, and access to a heated saltwater pool on the condo building’s shared rooftop. This exquisite condominium rental can accommodate up to 6 guests with four bedrooms and two bathrooms. Travelers seeking the best Oahu Airbnb rental combining Hawaii’s beach and city lifestyle should look no further! This gorgeous rental is just a 10-minute walk to the most famous beach in Oahu, and moments away from Waikiki’s most attractive restaurants and coolest shops. Popular with celebrities and locals alike, Kailua is the laidback Hawaiian paradise you’ve been dreaming of. 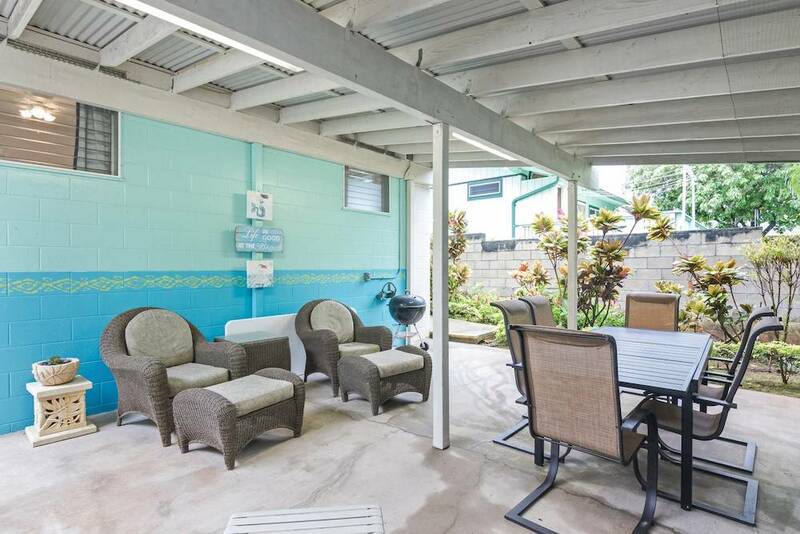 This charming Kailua Beach cottage Airbnb is a great choice for your first foray into this ultra-desirable Oahu neighborhood. 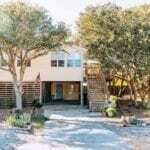 Available from just around $395 a night, this charming vacation rental is an excellent value for a small group and just a short walk from the beach. Relax in style with a group of up to 6 family or friends, with three bright bedrooms and two bathrooms to share. The open-concept floorplan creates an inviting place to lounge, dine, and cook, all together as a group. Enjoy the peaceful covered lanai and backyard, with plenty of space to lounge or whip up something delicious using the outdoor BBQ grill. Walk to the water in less than a minute from this luxurious, ocean view Lanikai Airbnb rental. This beautiful property is nestled between two exceptional beaches, Lanikai and Kailua Beach in Oahu. 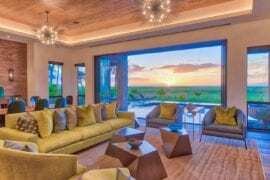 With soaring ceilings, a loft bedroom, and high-end furnishings, this spectacular space is ideal for a family or group of friends traveling to Hawaii together. Available from around $405 a night, this luxurious Oahu Airbnb can accommodate up to 7 guests in total, with three bedrooms (plus loft) and two bathrooms. 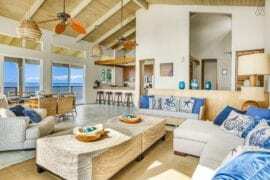 The large and open-concept living space is the perfect place to gather with the group, relaxing on the sofas or dining together with gorgeous views of the ocean. Take your coffee out onto the wrap-around balcony upstairs or lanai downstairs to really make the most of the incredible views! This family-friendly vacation home in Kailua has a natural, flowing floor plan and lots of lush outdoor space. Enjoy authentic “Hawaiiana” vibes throughout within this lovingly renovated, multi-generational family home. There’s space to accommodate up to 8 guests in the main house, with three bedrooms and two bathrooms. Inquire with the host about adding the additional guest suite to your booking in order to accommodate 2-3 more family members or friends. Available from around $400 a night, this is luxe Kailua living at its best. Breathe in that fresh, Hawaiian air from the extended, covered lanai and enjoy views of a peaceful canal nearby and the majestic Ko’olau Mountains in the distance. Kids will love this home and there’s ample space to roam and play in the huge, private backyard. 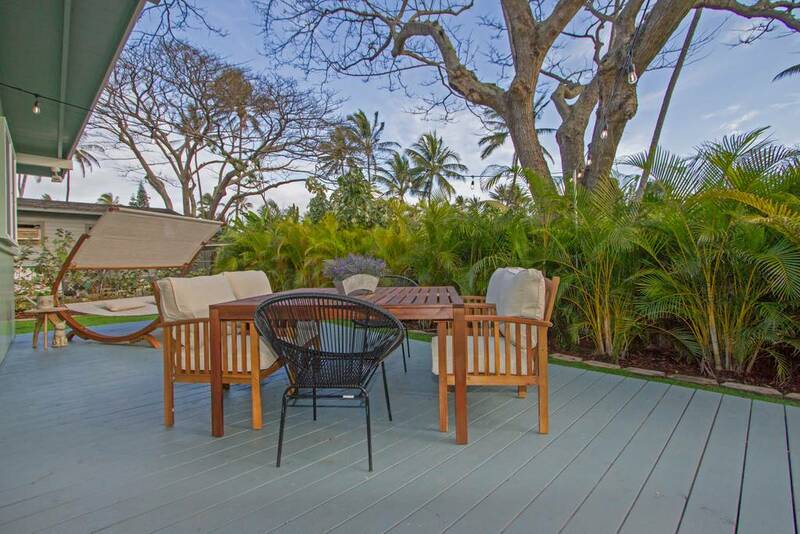 Grownups will appreciate the luxe styling and ideal location in Kailua, close to beaches, restaurants, shops, and more. 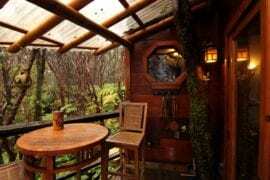 We like to save the best for last and this might just be the very best Oahu Airbnb rental ever! Set on a 1/2 acre of breathtaking land on the peaceful west side of Oahu, this beautiful oceanfront estate with pool is an absolute stunner! Enjoy perfectly blue ocean views in one direction and dramatic cliffs mountain views in the other for 360 degrees of jaw-dropping Hawaiian beauty. Available for around $800 a night, this magnificent Oahu Airbnb vacation home can accommodate up to 12 guests easily with five big bedrooms and three bathrooms. 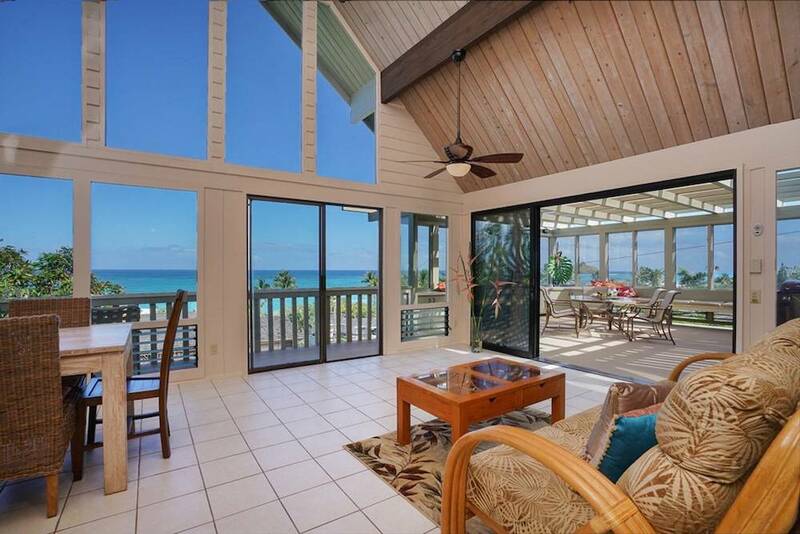 Each bedroom enjoys either ocean or mountain views, some with private balconies or lanai access. Outside, the gorgeous landscaped backyard includes an incredible swimming pool overlooking the beach and ocean beyond. Your friends or family will never forget the experience of staying in this memorable Oahu luxury home! 8 of the best Outer Banks Airbnb homes for your next beach vacay!